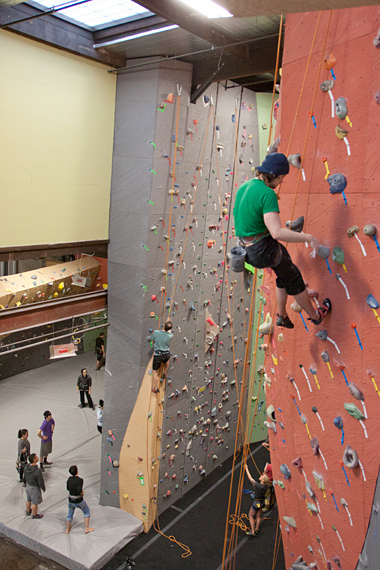 I’ve been going up to the new Seattle climbing gym lately to climb their 55 foot tall walls. Fletch and I have been there 3 times in the last 2 weeks. Rather than talk a lot about it I will just show the pictures. It’s a awesome gym, run by a very well organized group of people. 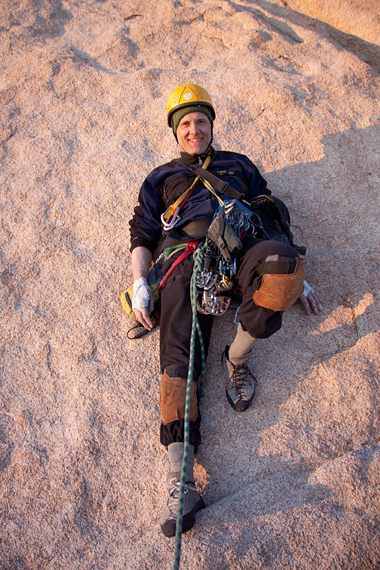 Below you can see a climber laybacking up a great crack that acts very much like a real flake outdoors. Below on the gray wall you can see the 3 cracks side by side. All run the full height of the gym. They are top rope only. 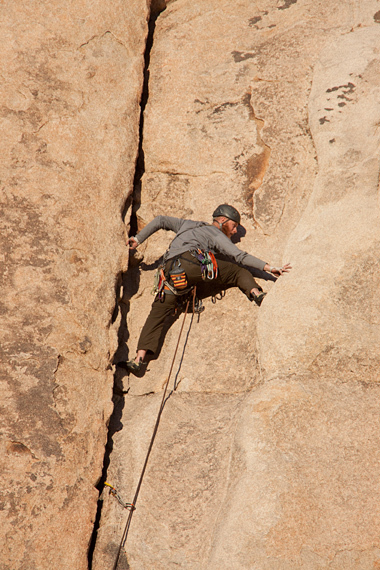 This climber is about to fall. It's heady up that high. Fletch and Vange showing their different finger sizes. Monday was a holiday for our college: Martin Luther King day. Tuesday it snowed a little so we started an hour late at 10. I had 4 students. Early Wednesday morning it snowed 4 inches and they cancelled college. 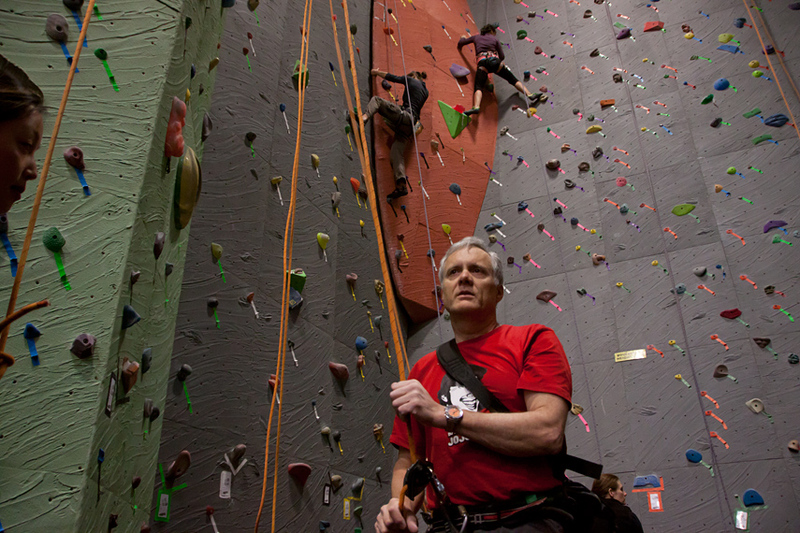 I was suffering from cabin fever drove in and climbed at the gym with Sue and Fletch. 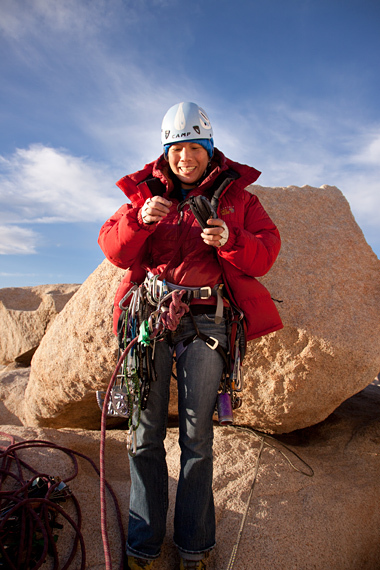 Sue tried out Christines body harness but it wasn’t the “cure all” solution to her back problems. Wednesday night I got an automatic text from college saying classes had been canceled. The mailman had just brought the kids Christmas presents from England (peacock handwarmers). These handwarmers, invented in World War 1, run 24 hours on lighter fluid. They run so hot that they ship with little cloth pouches to prevent burning your skin. I texted Clint and asked him if he was still going skiing the next day. He said yes. As it happened, his Christmas present to me was a free ski lift ticket. I checked Sue’s job, and her school was also having a snow day. Family ski trip! It was ironic that both our jobs were closed due to bad driving conditions…so what do we do? We drove 3 hours into the mountains through increasingly bad roads to go skiing in 14 inches of powder. Though I now have a 4 wheel drive car, and the best studded tires on the market, I still drive like an old lady in snow. I learned to drive in my 1975 Gremlin, may she rest in peace. It was a rear wheel drive sled and the lessons I learned about snowy driving seem stuck in my brain. I had to keep pulling over to let people pass me at 50 when I was driving 30 and 40. I don’t trust our RAV4 to be able to stop in a hurry if I come around a corner and find someone sideways. I did get better on the way back. The road to Stevens is sooo long. Eventually I stepped it up to 50 and kept up with the prevailing traffic. On the slopes, the snow was very forgiving and I didn’t fall for the first couple hours. We got there at 2 (Clint works swing) and skied until 9, though the last hour I was so tired it wasn’t too much fun. Clint took me through some tree skiing, but you have to turn very quickly…basically on a dime, and my telemark turns aren’t there yet. I had a great time out on the open slopes, powering through my tele turns. I’m tempted to try out the new downhill ski’s the kids have bought recently, but I don’t want to give up on my new tele gear. I only bought it last year and have a long way to go before I have it mastered. When we got home the power was out and Puget Sound was in the grip of a “snowpocalypse”. We were driving in ice and snow all the way to Clint’s house. There was 12 inches of dense snow in front of his apartment and I was very glad I had my four wheel drive RAV4. We woke up to an icy house and a 12 hour power outage. I slept in while early bird Sue started the wood stove. I’m sitting on the couch by the warm stove as the trees dump huge piles of snow on the ground outside. A huge 4 inch branch, what the loggers call a widowmaker just landed on the driveway. I went outside to move the car to a safer location between trees and it felt like being in the middle of a mortar attack. I guess it’s melting a little but it doesn’t appear to be going away any time soon. A huge branch just took out our Comcast cable internet line…funny, it still works even though it is lying in the snow on the ground. Sue says the barometer is over to “storm” again…the snowpocalypse continues. 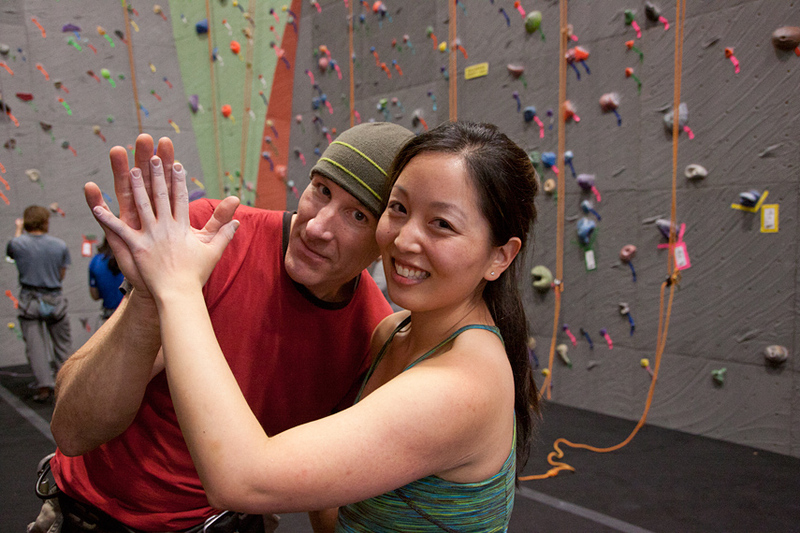 Fletch, Sue, Craig, Lisa, Julia and I drove up to the new Seattle Vertical World Indoor rock climbing gym Sunday and Monday. 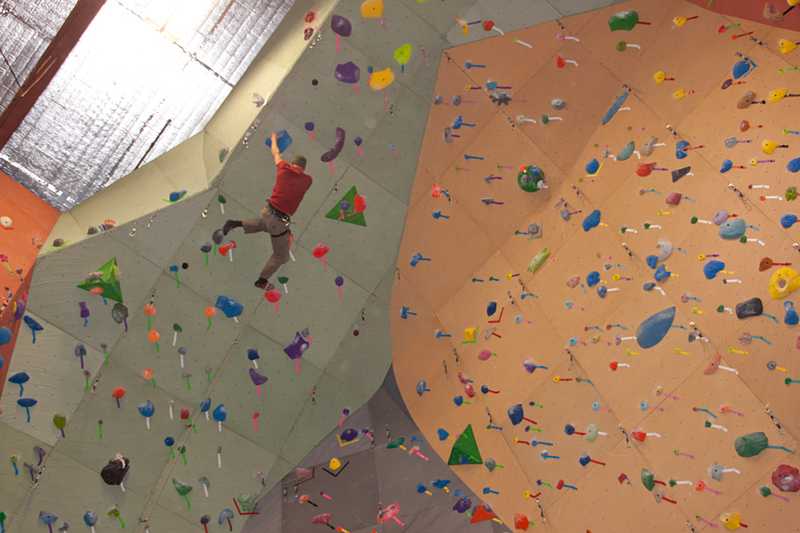 The walls are 55 feet tall, and when you climb up to the top, you feel like you are on a real climbing cliff, not just inside a building in Seattle. 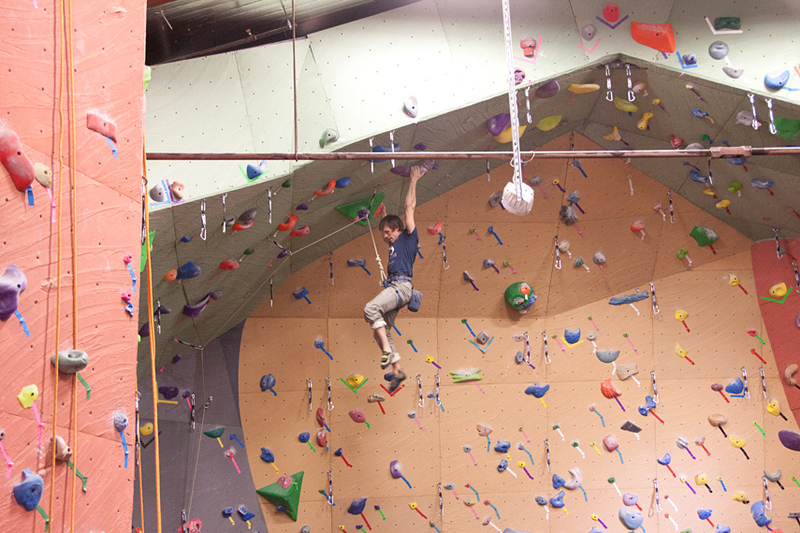 Those tall walls make our little gym in Tacoma feel very short indeed. 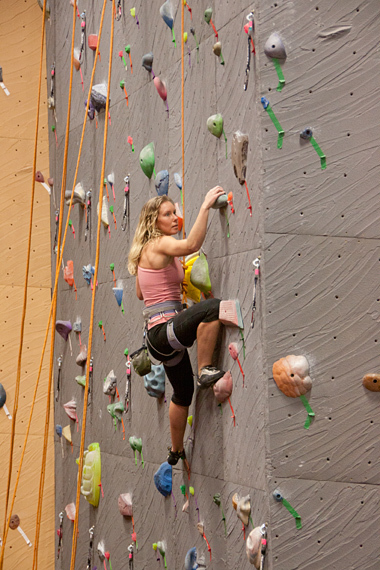 We have lots of fun in Tacoma, but there is no mistaking the fact that higher walls make for more fun. Plus they have 4 cracks in Seattle which range from a long layback crack, to a handcrack, to an off hands crack and a finger crack. 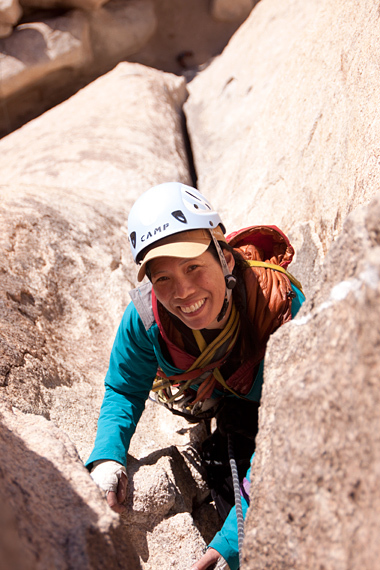 The cracks are beautifully made and super fun to climb. 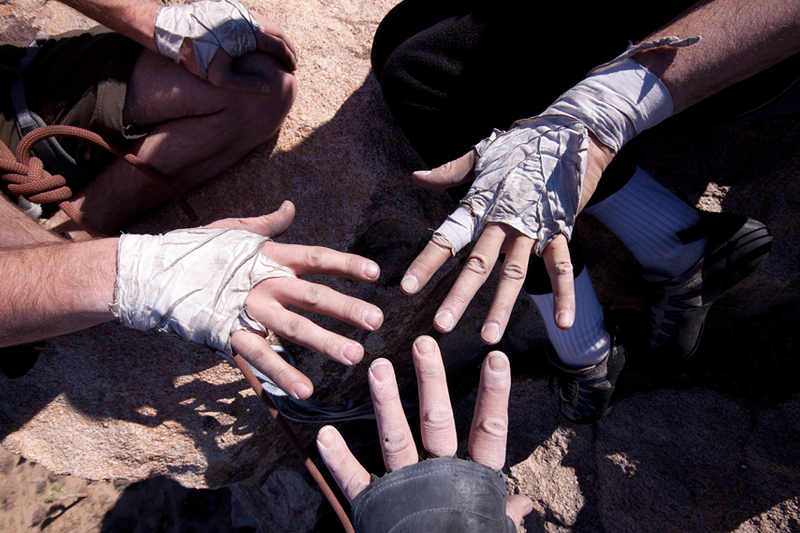 The finger crack may be the best “all fingers” crack in the state. It is consistently perfect fingers for 55 feet. 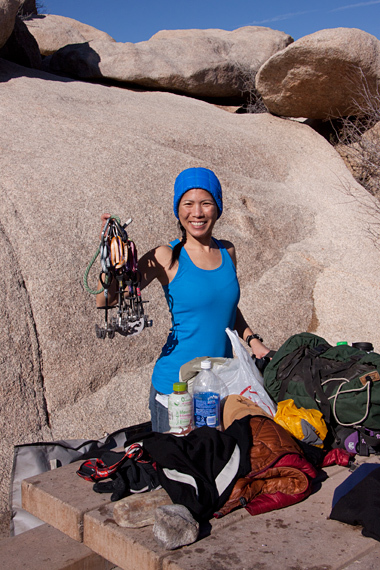 The lead climbing area is amazing. 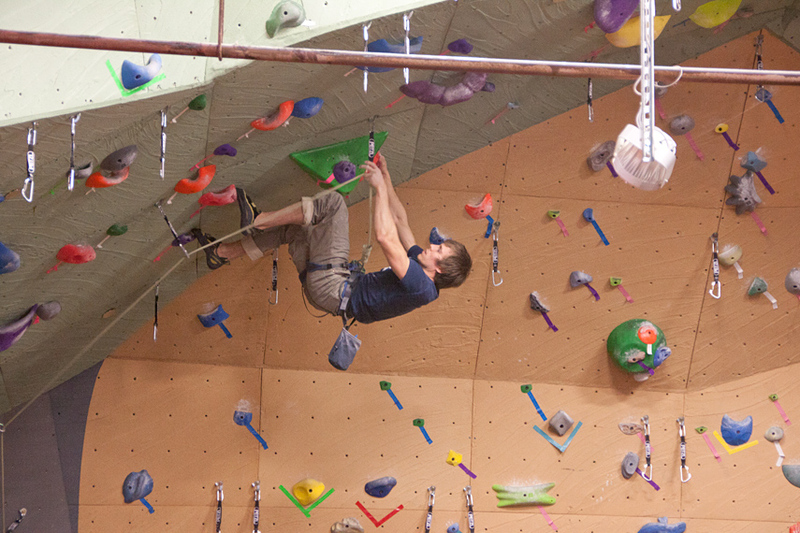 They have routes starting at 5.8, and some of the nines go completely horizontal when they reach the ceiling, which means they are longer than 55 feet once you add 12 feet of ceiling climbing. When you fall from up that high and drop into air…it’s scary, but fun. I can’t wait to get back up there. It might be as much fun as going to exit 38, since they are both bolts, and the routes are about the same height. 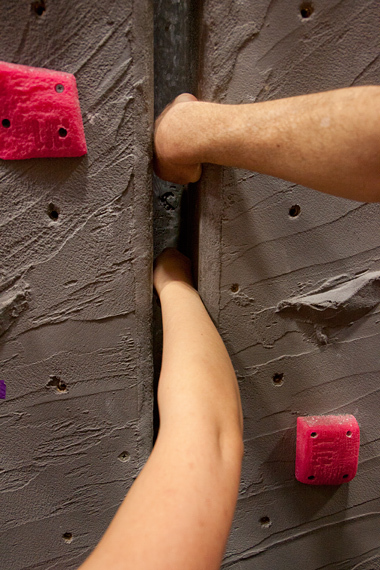 When I got back from vacation I was climbing poorly at the gym . 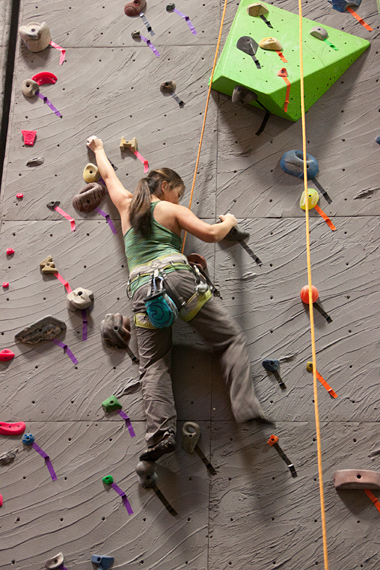 This is typical because climbing outside uses different muscles than climbing indoors on plastic. 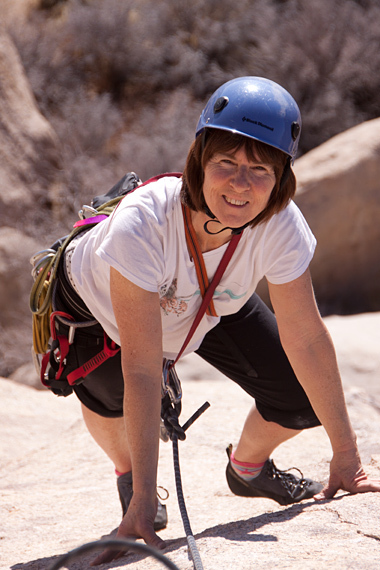 Last night I was on my third session, and while my hands weren’t much stronger, my overall balance, power, strategy and grace were showing the effects of two weeks of full time climbing. My moves were sure, powerful and directed to optimize my reach, as in: leading with the hip, crossing through, getting in the zone…all the skills I normally forget about in city living. 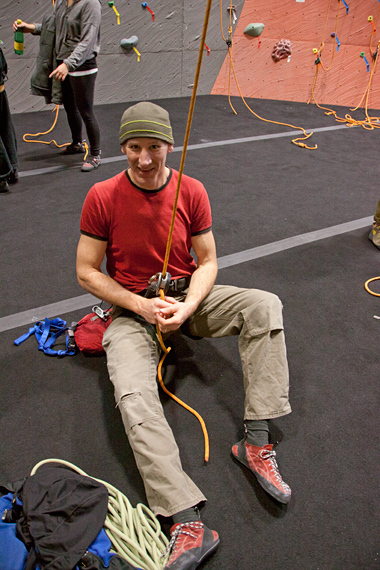 I was climbing with a new partner, and we were doing the top rope routes. There are some very good TR routes. 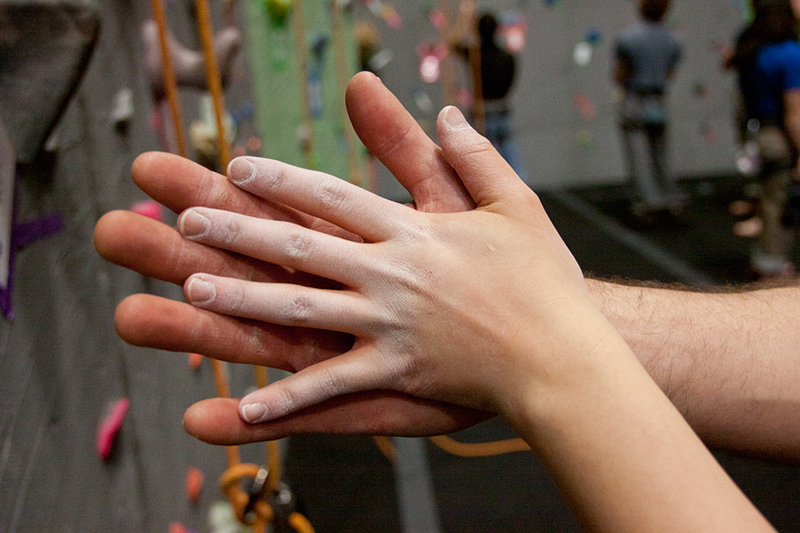 They feature cerebral climbing, as opposed to just crimpers and muscle moves. I’m also feeling the urge to paint again. I watched a movie about an art student called Cashback on netflix. It was your typical frustrated young art student film, but with some strange plot twists involving the ability to stop time, and then walk around in the moment while everyone is frozen as in a life drawing class. The concept was original, but what moved me the most was when his friends set him up with a false gallery interview. He shows up to the gallery with his drawings, only to find his friends had set him up as a prank. He says: “You mean I don’t have an appointment?” The gallery owner says: “No, but as long as you are here, what do you have?” Which leads to a big one man show. I need to start painting again. Here I sit at this big glass screen, pushing on these little plastic keys. How can this compare to the happy go lucky life of a dirt bag rock climber? 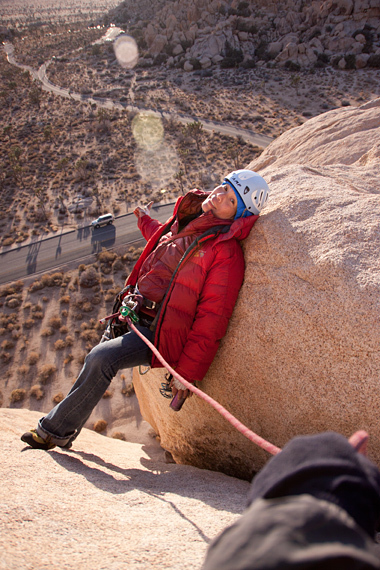 Don’t get me wrong, I love my job, but it doesn’t hold a candle to the climbing life. 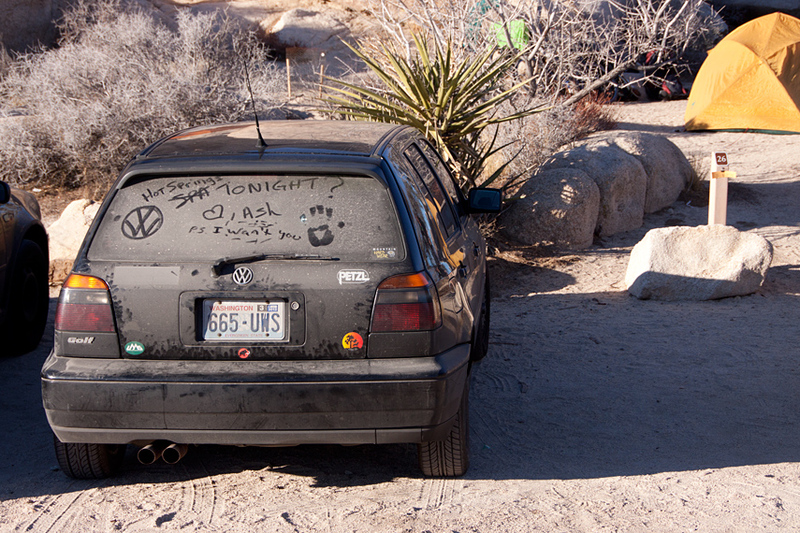 We went down to Joshua Tree for the holidays. Do you know this Joni Mitchell song? If you know that song, then you will understand when I say that Jtree was my river this year. 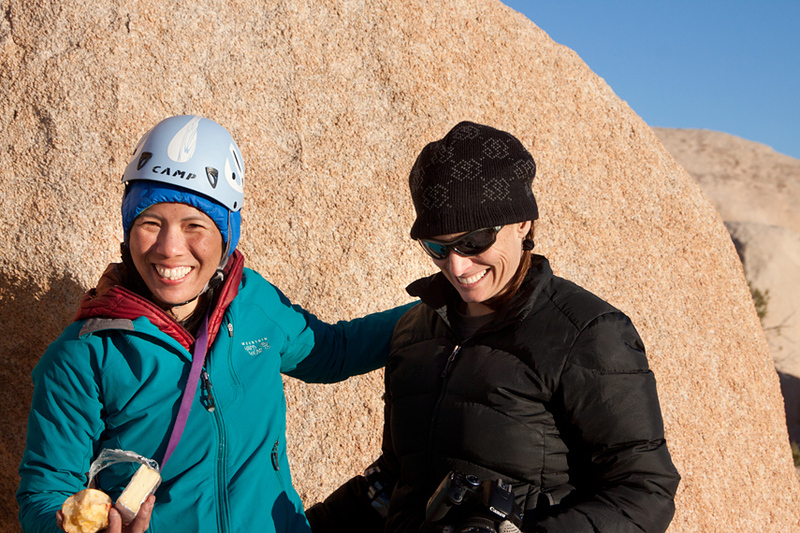 I drove down with Merica and we climbed for a week in puffy weather. I exchanged Merica for Randy and Sue on Christmas at the Palm Spring airport. Craig, Ashlie, Michael, Ammon McNeely, Vladimir and Des also showed up and stayed for all or parts of the trip. Merica and I got down in 23 hours, arriving at 6 AM Sunday. We crashed in a vacant site until 10 and then got up and climbed the bong. 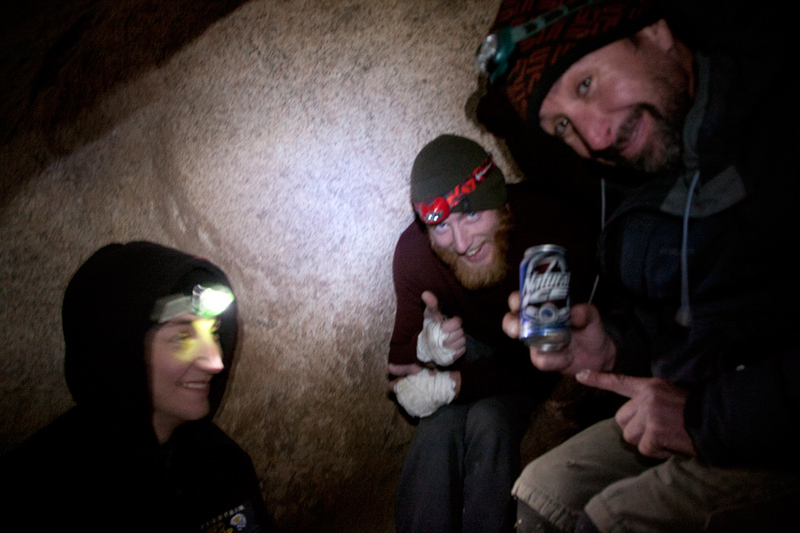 On the walk back through the campground, Merica saw some climbers leaving site 27 and we snagged it for the duration. On Monday we were climbing at Quail Spring Picnic Area and Craig walked up, having driven down in 19 hours, including a 3 hour nap. That means he shaved 6 hours off our time. He says he just drove faster, but that doesn’t seem possible. I think he got abducted by aliens. Ashley showed up in a few days with Michael and Ammon McNeely. Ashley, Michael and Ammon are all living and working in the skydiving industry in Lodi, California. 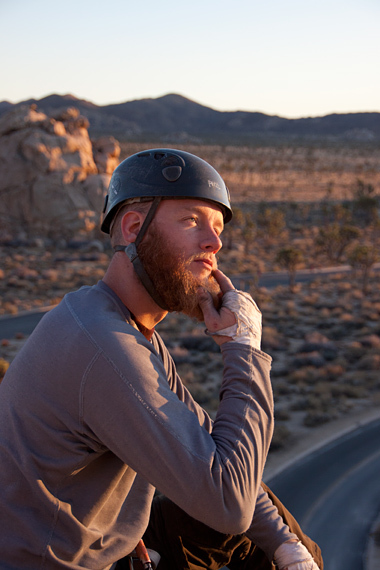 Ammon has been called the best aid climber in the world and a google search will return many great stories. He is a master story teller. 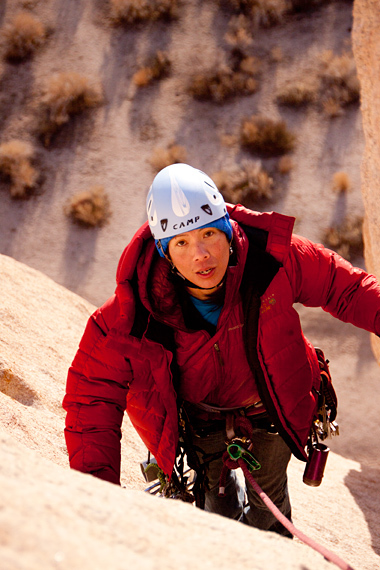 We spent many nights around the campfire listening to his adventures on El Cap, and his close calls base jumping. His best story was about the time he and two others jumped off a 500 foot electric power transmission tower. They had a less experienced jumper with them who had not bothered to pack his chute. He was supposed to hold it in his hand until they flew through the wires, and then release it for inflation. Instead, he released the chute early, before they had fallen through the wires. His chute partially inflated and the lines caught in Ammons shoe. Ammon says he thinks he saved the guys life because Ammon pulled him away from the powerline. But then they were both falling toward the ground, and neither could open their chutes due to the tangle. Ammon was frantically trying to pull his foot out of the other guys chute lines as he watched the ground rush towards him at terminal velocity. Finally he pointed his toes and his foot popped clear. The other guys chute was able to open and Ammon pulled his rip cord…at 55 feet. He said his chute popped, he flared, and he landed, all in about 2 seconds. 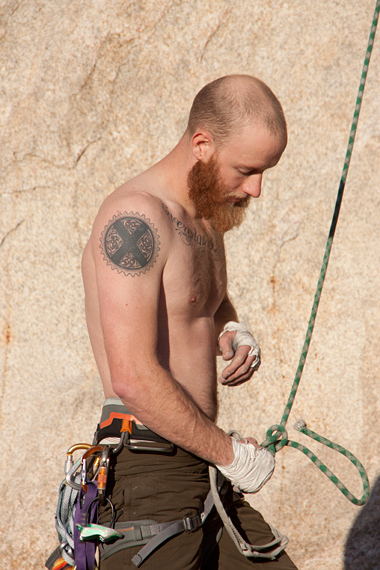 Ammon had many other stories, too many to recount here, but I will say that the story about his 80 foot rope solo whipper, and the denied rescue attempt on El Cap was fantastic. They told him to hold up two hands for no, and one for yes. 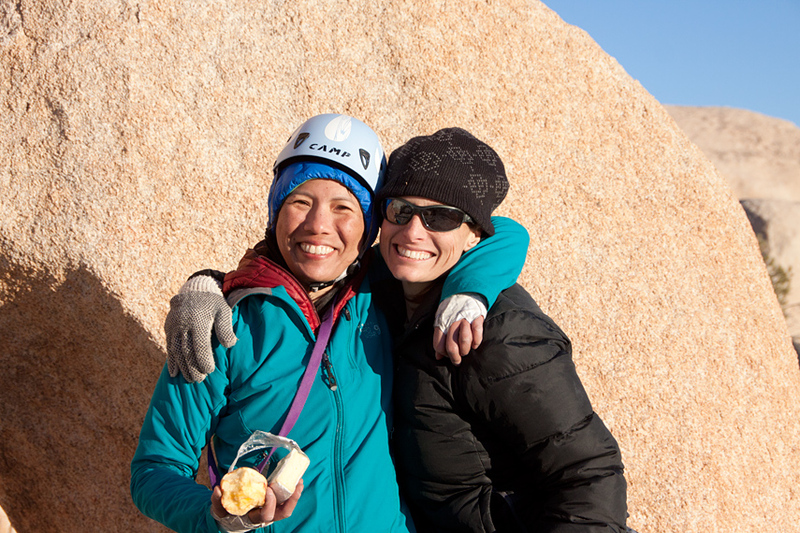 Merica and I had to wear puffys and carry my handwarmers to stay warm, but we had a great time warming up on the many easy Joshua Tree rock climbs. By the time Randy and Sue arrived Christmas weekend I was starting on the 5.9’s. 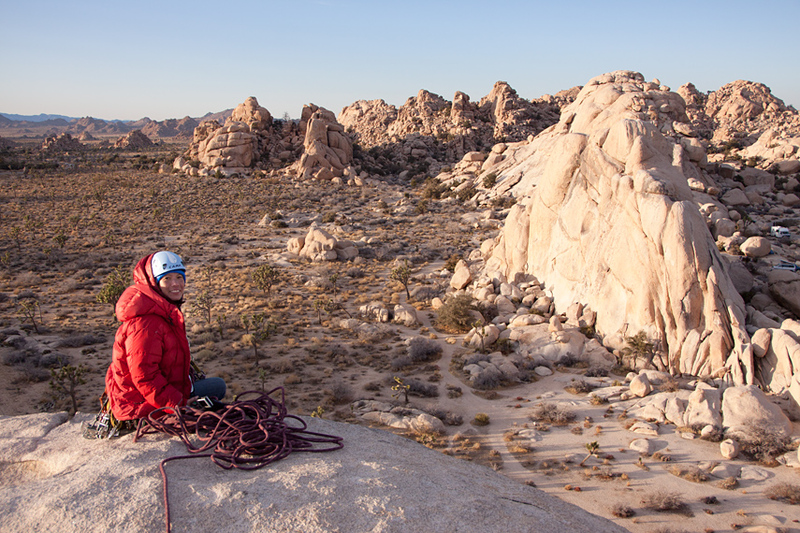 Joshua Tree has old school ratings, which means that you may find, as I did, that you can get gripped out of your gourd on a 5.5. Double Dip is a case in point. I led Merica up that one thinking it would be a cruise. I got totally bugged out at the 30 foot runnout. The fall would have meant a hospital stay. My friction skills were rusty and climbing up those friction holds with the bolt gettting further and further away was unnerving. I don’t know if it was the weirdness of the climbing, or my whining, but Merica didn’t want to climb anything else there after Double Dip. We left and headed over to Toe Jam, which she liked a lot better. I also took Merica up Bat Crack. 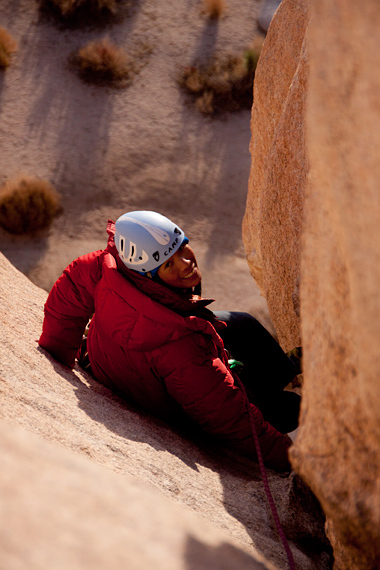 Bat is a long 5.4 that goes all the way up Intersection Rock in one long pitch. It starts out in a cool body slot chimney, passes a 10,000 year old car sized pile of bat dung, traverses some thin face climbing and finishes with 30 meters of wide crack. It’s a very lovely pitch. Merica climbed it in her puffy coat. Because it gets dark and cold at 5 there is a lot of time to kill each evening. 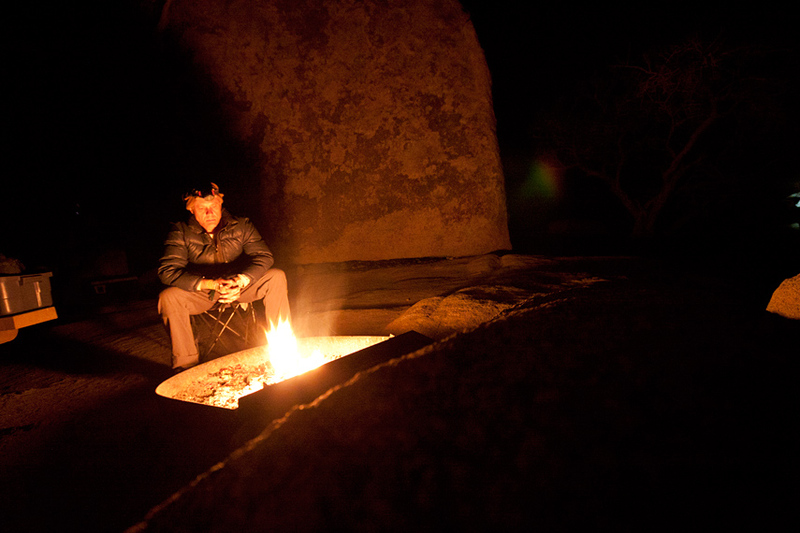 Dinner and a campfire is nice, but wood is expensive so we went out exploring in the desert on night hikes. 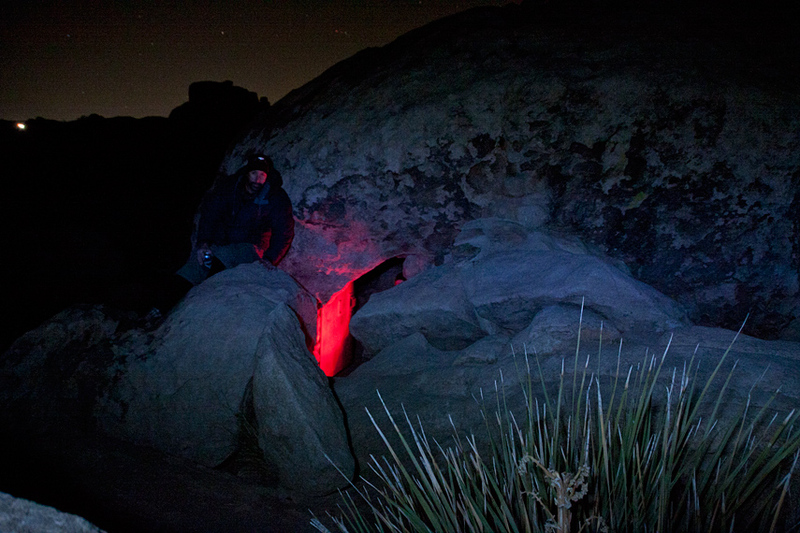 A prime hiking destination from Hidden Valley campground is the famous Iron Door cave. Legend has it that a frustrated parent locked his developmentally disabled teenage son in the cave back in the last century. He would shove food in through holes in the sides of the locked cave and then leave. 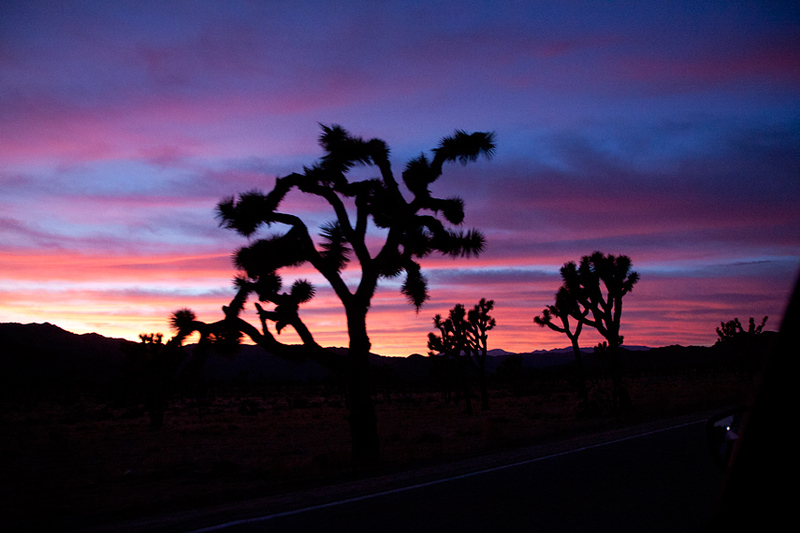 Craig and I tried to find it one night and gave up after wandering around in the desert for two hours. 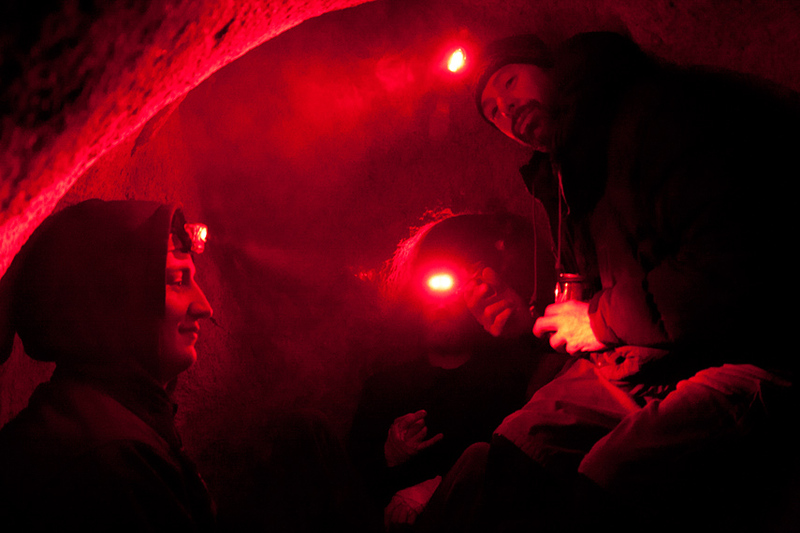 We stayed warm, but never found the Iron Door cave despite my having been there before in the day light. 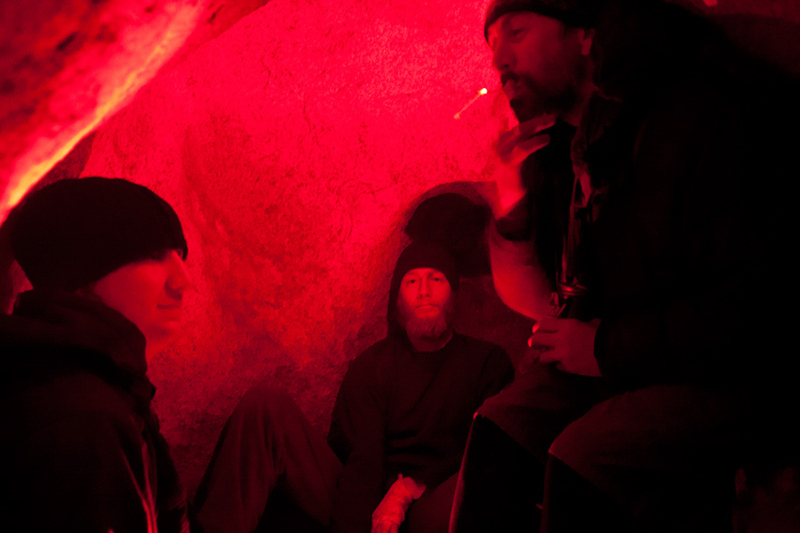 I captured this photo by having Craig sit in the cave with his red headlamp shining on the door. It set my Cannon 50D on a rock with a 10 second delay to about a 5 second exposure. 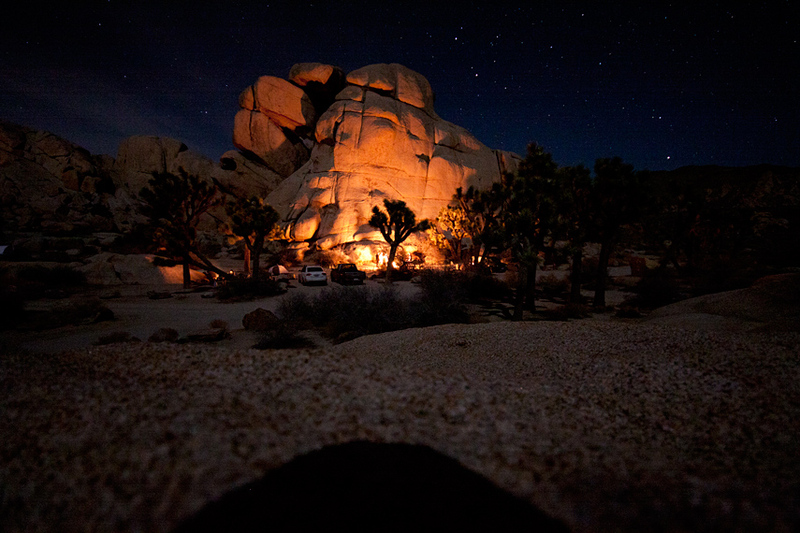 During the exposure, I painted the rocks with my led headlamp, hence the blue coloring. I did not do any post processing in Photoshop. It came out of the camera like this. 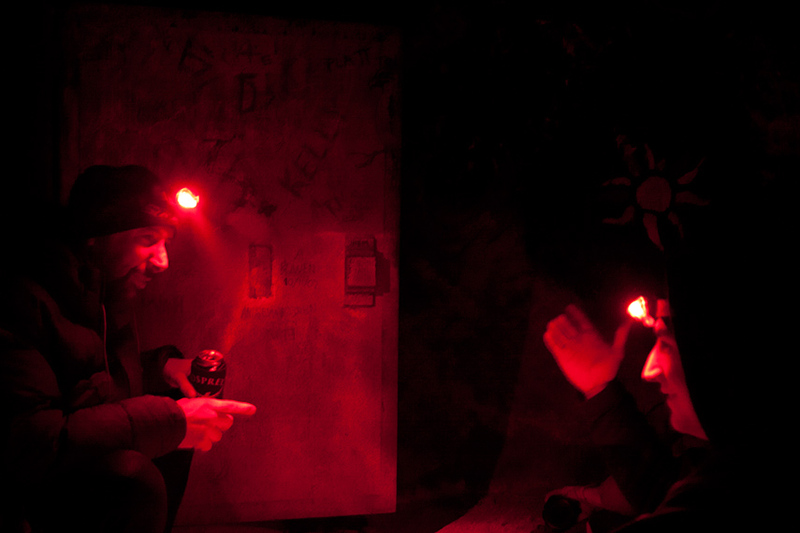 Red headlamps make cool lighting! I believe Ammon might have been smoking some of that wacky tabacky. 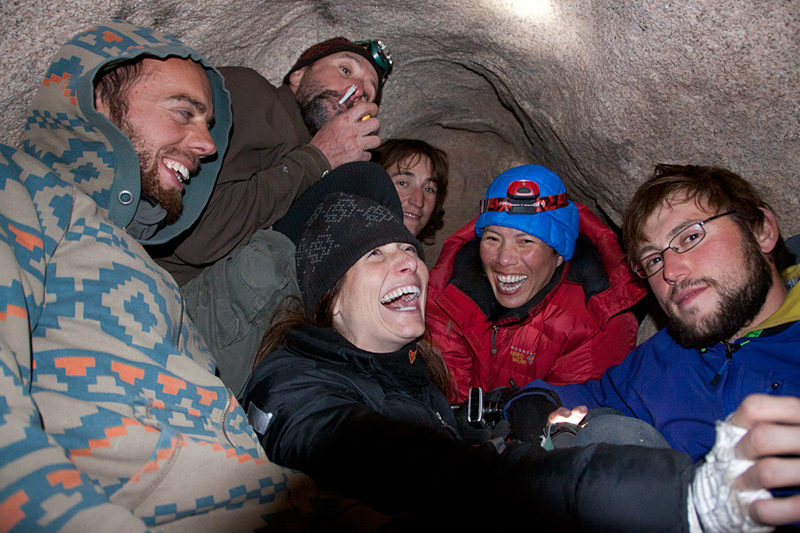 I was glad to get out of there…the smoke was getting thick in that tiny little cave. The girls had wisely decided not to accompany on our first night time hike. After leaving the Hobbit Hole, we headed back through the dark starry night towards the campground. Ammon, our guide, had imbibed rather heavily and was unsure of the way. All the desert mounds look similar at night and we soon realized we were lost. I located the north star and thought we could simply walk south. We would be bound to eventually hit one of the roads leading out from Intersection Rock. But after wandering south for a while, Ammon came to life and decided we were too far East. He took the lead again and we walked South West for half an hour until we saw a white spot reflecting light on the horizon. It turned out to be a 25 MPH speed limit sign on a road…but what road? And which direction should we walk on said road? We turned right and walked for 10 minutes but decided it was the wrong direction. We turned around and walked the other way, eventually spotting the campfires of Hidden Valley campground. I was completely turned around by that time and had no idea where we were until we walked into the actual campground. 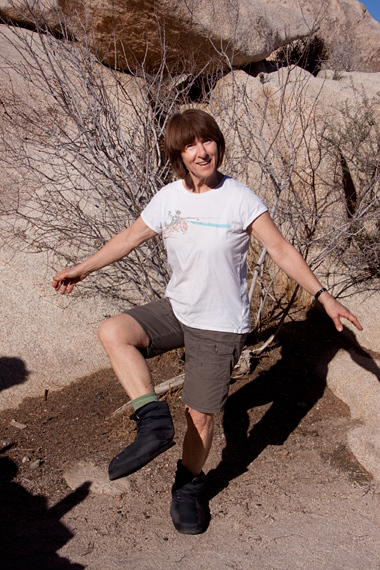 The next day was windy so we drove down to Indian Cove for warmer climbing, food and showers. Craig and I had an awesome day during the first week where we ended the day with half an hour of light left. We realized we just had time to sail up Damper over on Chimney rock. We hot footed it over there and he led it with just two pieces of gear. I raced up it quickly thanks to my fat feet and hands. At the top we had time for a exactly 4 photos before the sun dropped below the horizon and the temperature dropped 20 degrees. 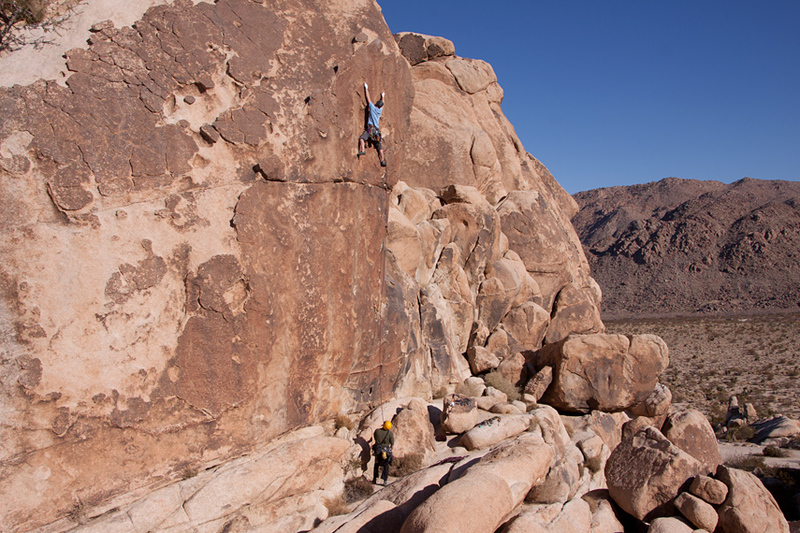 There is no anchor up there, and if you don’t know your Joshua Tree descents it can get desperate. Someone had rapped off a brand new yellow Metolius cam and Craig snagged it. If only I hadn’t blown the rock paper scissors that cam would have been mine. Friday night was Merica’s last night before her flight home. 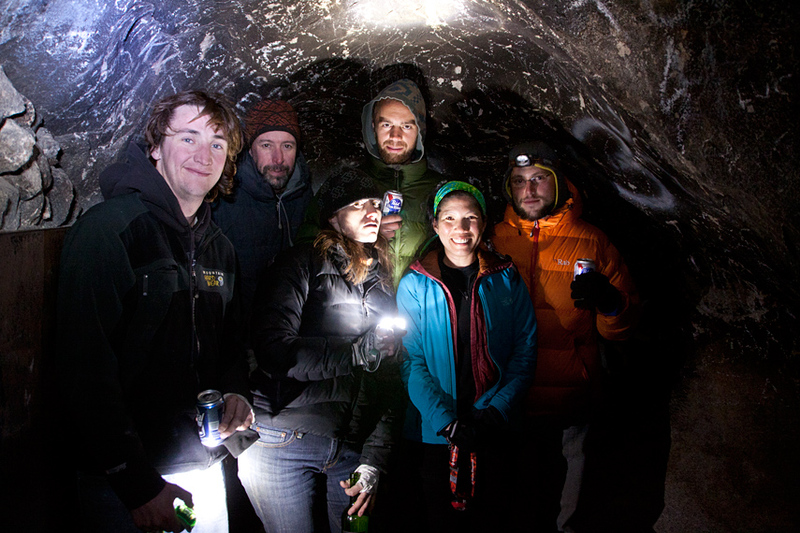 A couple Swiss guys joined the 7 of us for a grand tour of the night time hotspots. We headed towards the Iron Door cave again, this time with me in the lead. 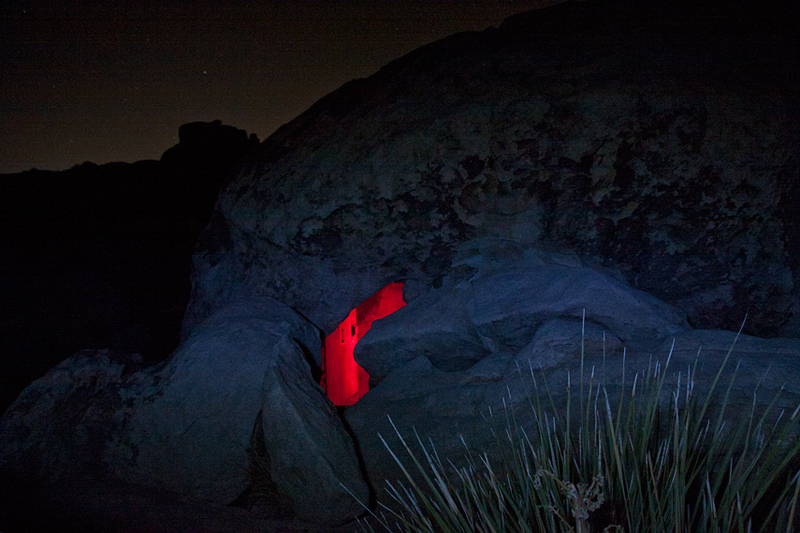 Ammon walked behind me double checking my navigation in the moon light. I nailed it first try, he was a good teacher. 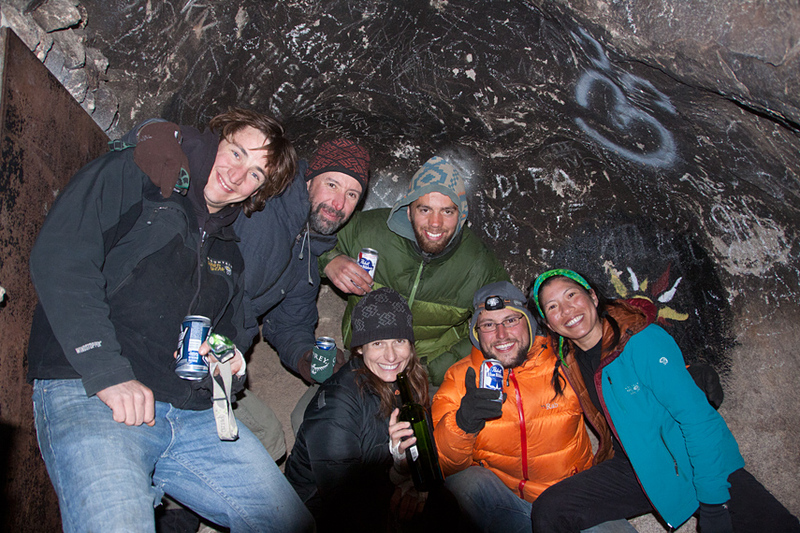 The Iron Door cave is only an 8 minute walk from the campground if you know the way. Starting from the left is Michael, who works as a sky diving instructor in Lodi. Second from left is Ammon McNeely. Ammon and Michael know each other through Base Jumping. Ashlie is also trying to break into skydiving as a career and knows them from Lodi. Merica, my climbing partner is in the blue coat is surounded by the two Swiss guys, whose names I don’t remember. 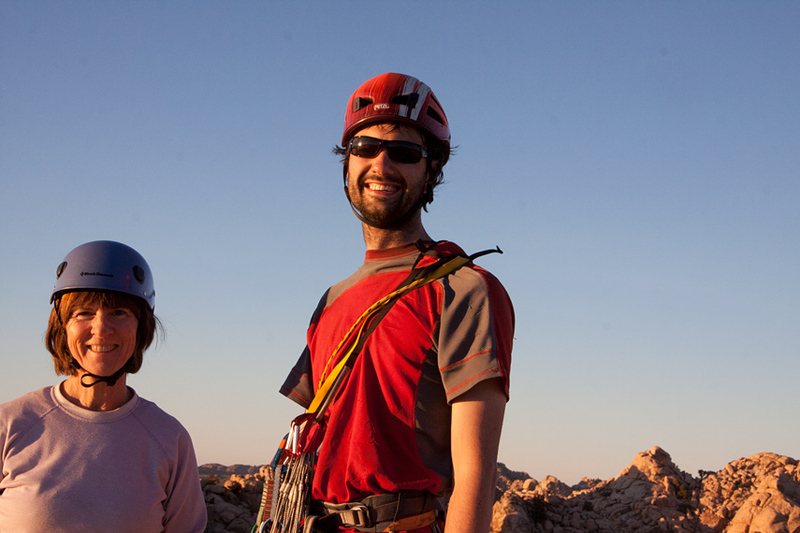 They were super nice guys, and very talented climbers on a 3 month climbing trip between college and career. 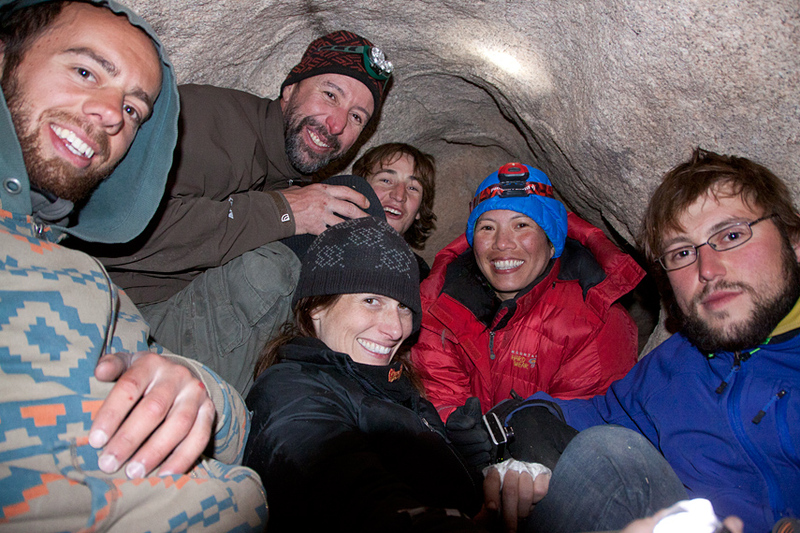 The seven of us were packed like sardines in the tiny Hobbit Hole cave. 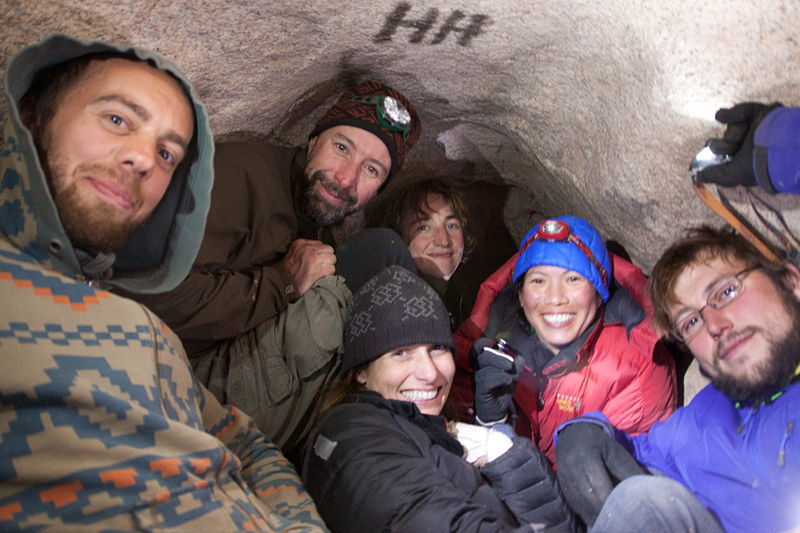 There were so many of us in the tiny cave that it actually started to warm up the air. Ammon and Michael kept passing around some kind of wacky tabacky and the smoke got so thick I had to leave them to it for the fresh air outside. We found our way back to the campground successfully that night. 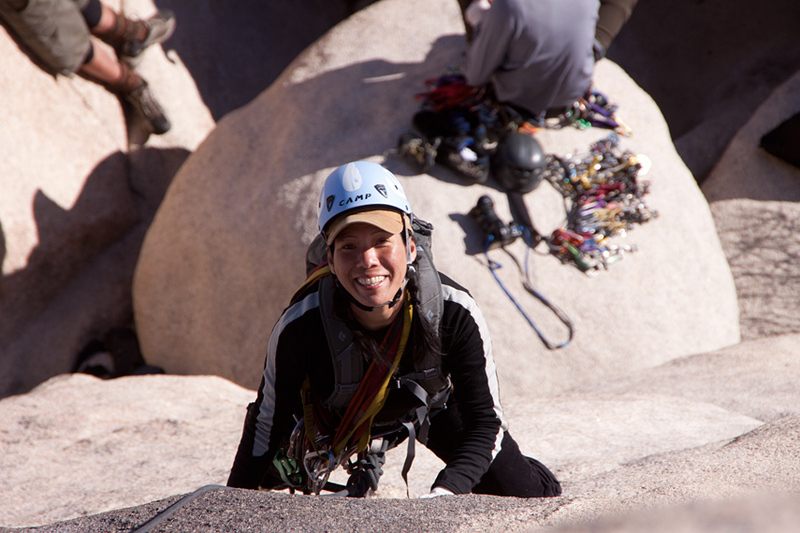 I was ready to call it quits as I had to pick up Sue at the airport the next day but everyone insisted I couldn’t break up the team…so we headed off for the Chasm of Doom. 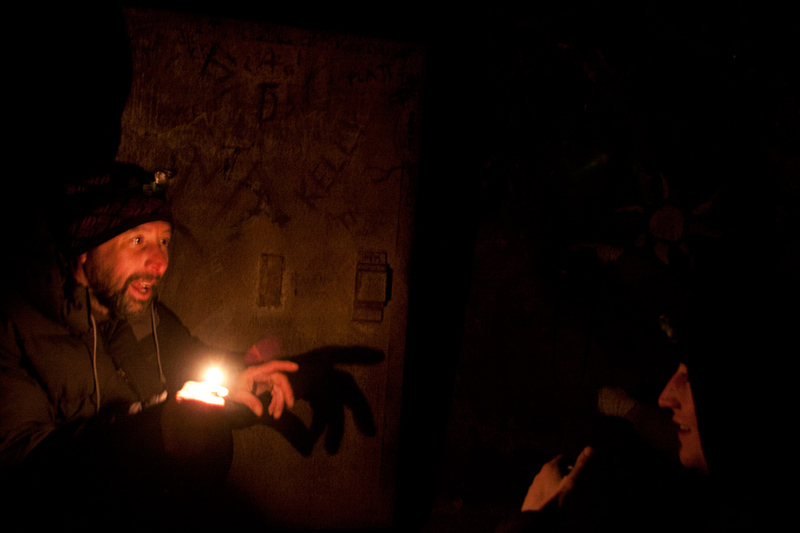 This is normally done without headlamps as a sort of exercise in trust. You are supposed to climb through it with a guide in pitch darkness, holding onto the person infront and behind, with each person telling the next where to place their feet and hands. 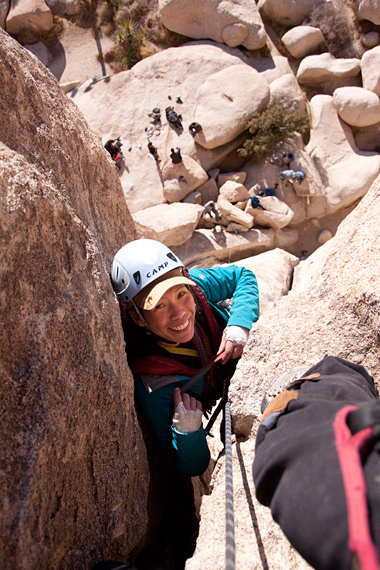 The Chasm starts at the bottom of a rock tower and climbs up though the center of the tower in a hidden tunnel. 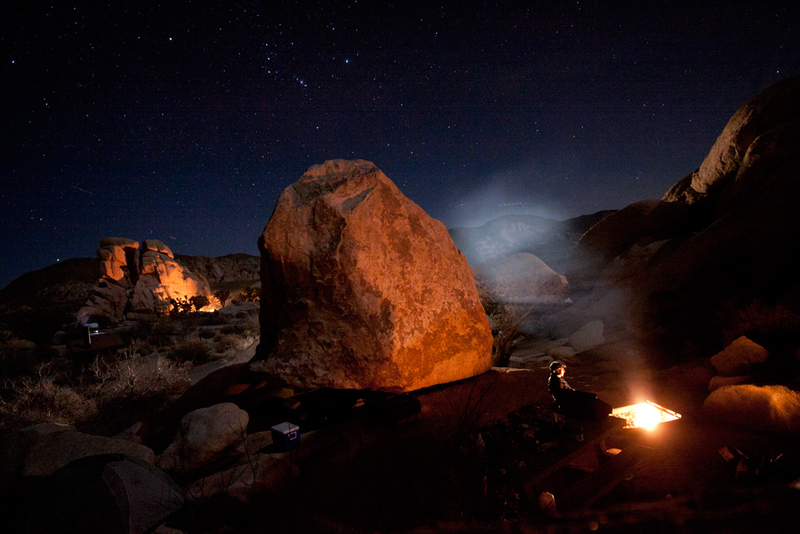 It’s a bizarre formation that has occasional glimpses of the stars over head, but is mostly completely enclosed by overhanding boulders and huge slabs of rock. 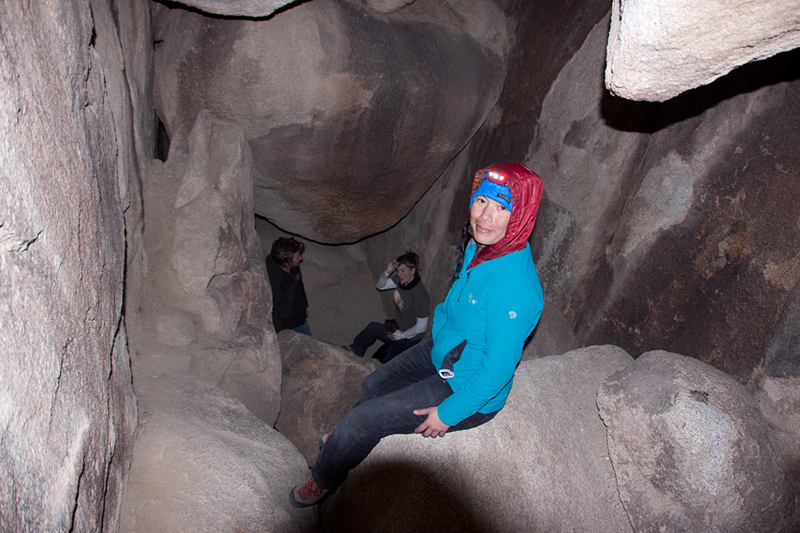 With headlamps it’s a lot safer and we made our way quickly up through the chasm until the birthing canal. This is a body sized chimney that ascends to the balcony overlooking true hidden valley. A fall here would not be pleasant and I was wishing I had not worn my chaco sandals. The drop down the chimney is about 35 feet, and it would take some caving specialists to extract you from a fall at the wrong moment. This is Merica in the easy part of the Chasm. Towards the end of the trip Craig and I were getting warmed up. He towed me up Bearded Cabbage, and I led Vladimir up Orphan. Craig also followed me up Dandelion which I had never climbed before. It is a lovely 10 left of Toe Jam. I also led Craig and Randy up Papa Woolsey. 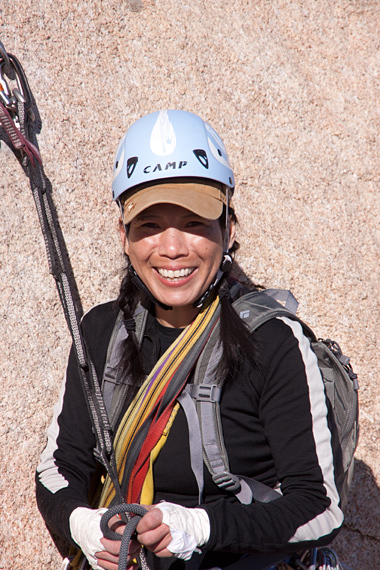 I didn’t serve my usual apprenticeship over at Echo slab, choosing to focus on crack climbing, instead of run out slab. 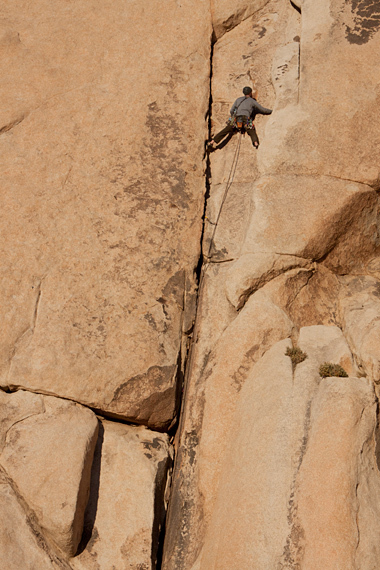 On the last day we tried to lead O’Kelley’s crack, but couldn’t get past the bouldery start. We should have just done a hand stand, or climbed Wangerbanger…but decided to go do something we could easily get up before starting the epic drive home. We found this little outcropping at the Lost Horse road intersection and we all led some moderate climbs followed by this finger eater. 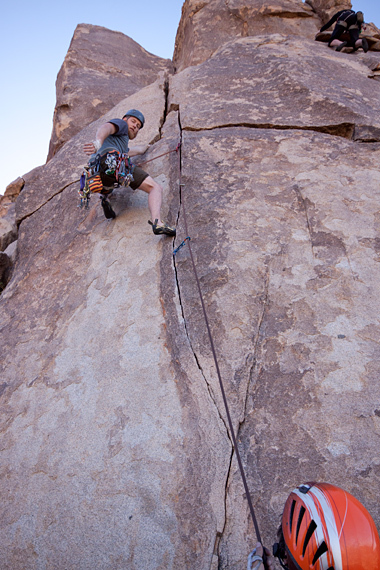 Craig on a 10d on our last day after getting shut down on O’Kelley’s crack. Finger sizes: Craig on the left, Randy at top, me on bottom. On the drive home, we missed some turns and took a tour of Riverside on highway 60, and Stockton on highway 99. It’s strange how you can be driving those LA freeways and completely miss a critical exit. You suddenly find yourself miles from the correct road, with no way to turn around. We had three gps’s in the car, but thought we were smart enough not to need them…wrong. My older, hand built journal is organized by years and months. Pick a year, then click on a month.